For the first time in seven seasons Loughuile Shamrocks will not contest the Antrim senior hurling championship final. 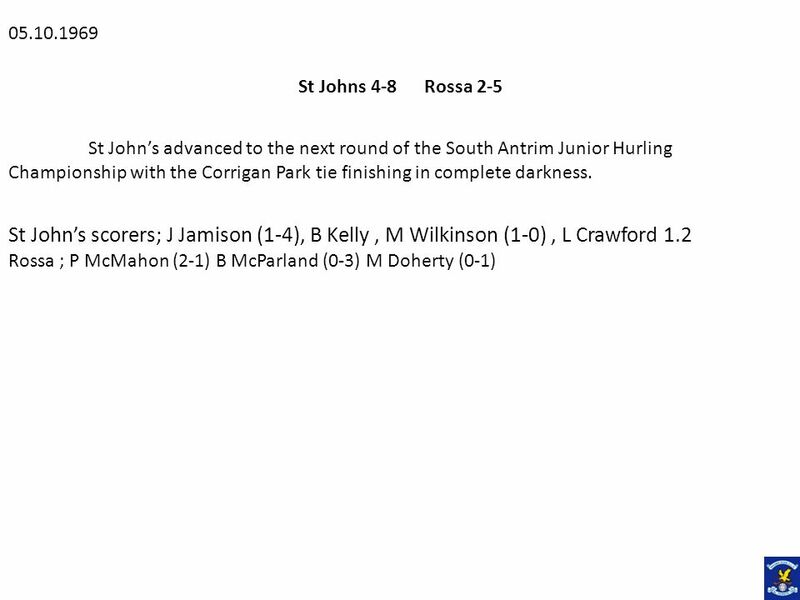 A shock of the season defeat by two points at the hands of St John’s at Casement Park in the semi-final also prevented the North Antrim club from a rare fourth successive title- a feat last achieved by Rossa. 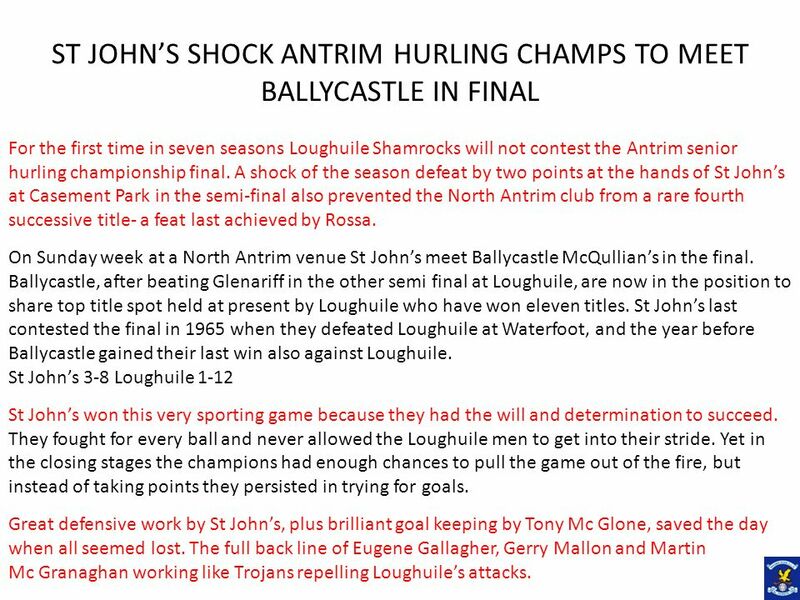 On Sunday week at a North Antrim venue St John’s meet Ballycastle McQullian’s in the final. Ballycastle, after beating Glenariff in the other semi final at Loughuile, are now in the position to share top title spot held at present by Loughuile who have won eleven titles. 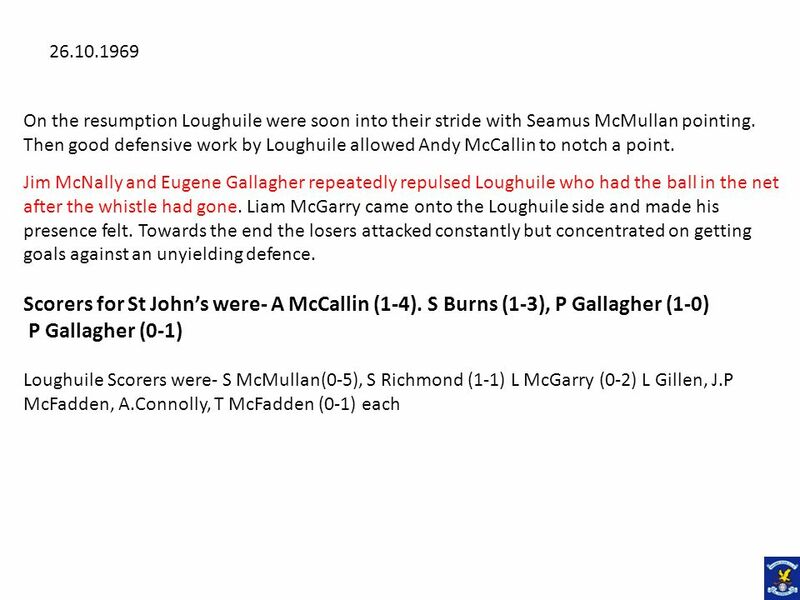 St John’s last contested the final in 1965 when they defeated Loughuile at Waterfoot, and the year before Ballycastle gained their last win also against Loughuile. St John’s 3-8 Loughuile 1-12 St John’s won this very sporting game because they had the will and determination to succeed. They fought for every ball and never allowed the Loughuile men to get into their stride. Yet in the closing stages the champions had enough chances to pull the game out of the fire, but instead of taking points they persisted in trying for goals. 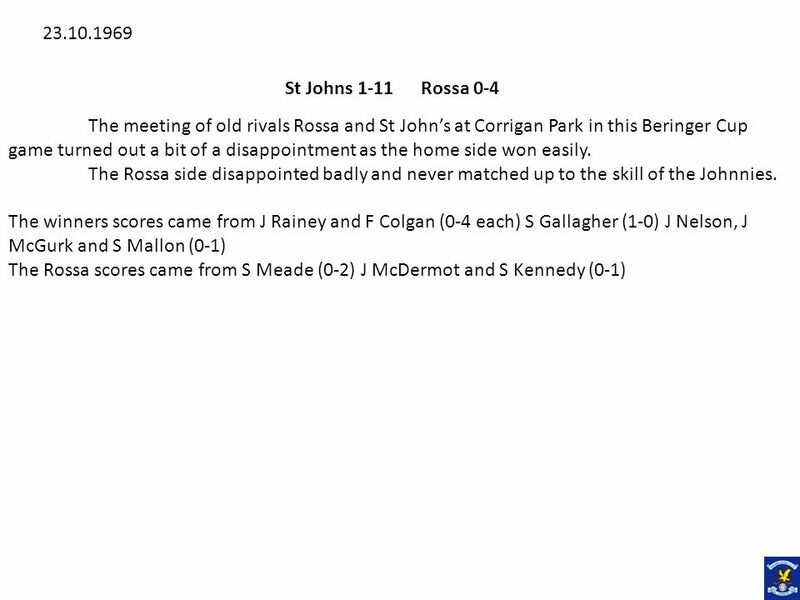 Great defensive work by St John’s, plus brilliant goal keeping by Tony Mc Glone, saved the day when all seemed lost. The full back line of Eugene Gallagher, Gerry Mallon and Martin Mc Granaghan working like Trojans repelling Loughuile’s attacks. 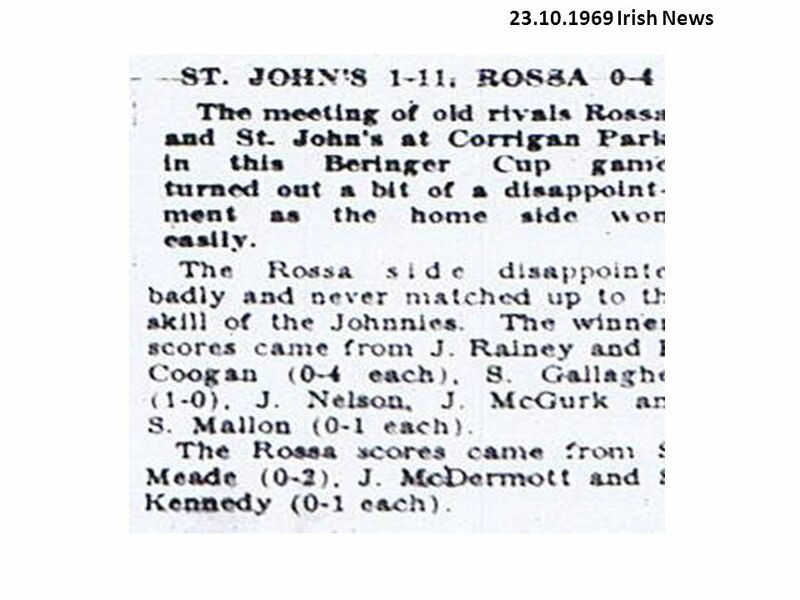 9 The half-back line was equally effective where Jim McNally kept Seamus Richmond on a tight rein. Arty McGlone and Harry Trainor got through some solid work as well. Sean burns at centre field started slowly but when he got moving the Loughuile Mid-field never counted. In fact it was the brilliance and experience of Burns that turned the tide. Tonic Goal For the first twenty minutes it was all Loughuile as they led to 1-5 to 1-0. Then St John’s were awarded a 21yard free which Sean Burns drove the ball low and hard at the net. This goal gave John’s a new lease of life and from there on they dictated the trend of play. In attack Andy McCallin gave a sparkling display and was well supported by Seamus, Mickey and Pat Gallagher along with Brendan McGurk. Loughuile were rather disappointing as they were too easily knocked of their game and allowed St John’s to set the pace. 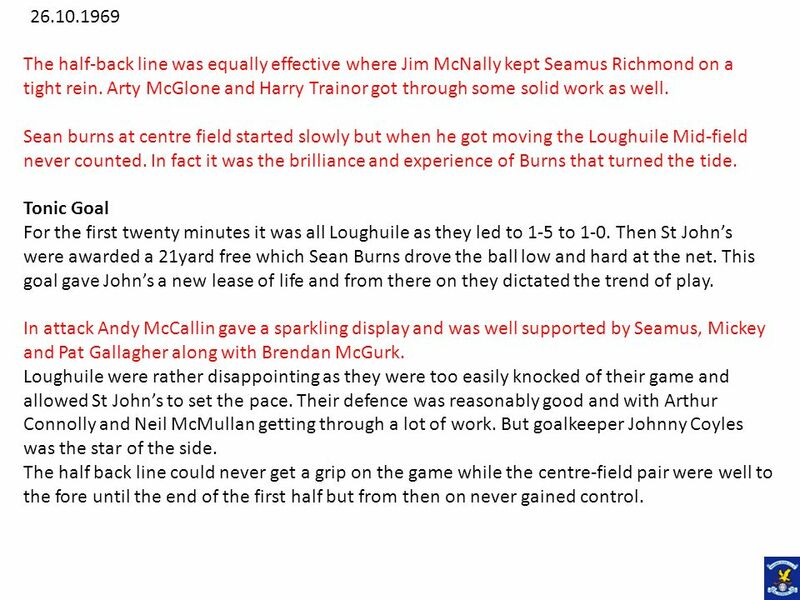 Their defence was reasonably good and with Arthur Connolly and Neil McMullan getting through a lot of work. But goalkeeper Johnny Coyles was the star of the side. The half back line could never get a grip on the game while the centre-field pair were well to the fore until the end of the first half but from then on never gained control. 10 On the whole the attack never functioned properly with only Brendan McGarry, Seamus Richmond and Liam McGarry prominent. Both teams attacked before Seamus McMullan with a point from a free in the sixth Minute. 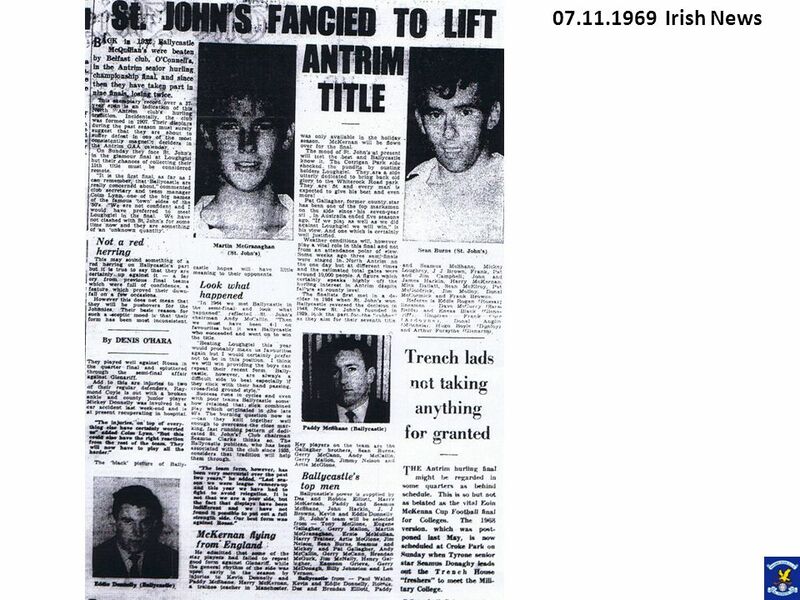 St John’s attacked but Seamus Gallagher wided. Then at the other end Gerry Mallon brought of a great save when a goal seemed certain. From 70 yards Dan Gillen pointed and Loughuile were well in top Seamus Richmond sending his side further ahead with a 10th minute goal. The lead was further stretched by a J.P McFadden point. St John’s came more into the game and against the run of play. Pat Gallagher scored a goal but Seamus McMullan and Tom McFadden replied with points apiece. Coyles brought off a number of good saves and then came Sean Burns goal which swung the game in St John’s favour. St Johns now had their tails up and started to hurl with determination. Andy McCallin tormented the Loughuile defense before grabbing a point. Rank bad shooting prevented them from getting further scores. Then Seamus Richmond had the miss of the hour when from ten yards he let fly for Toy McGlone to bring of a spectacular save. 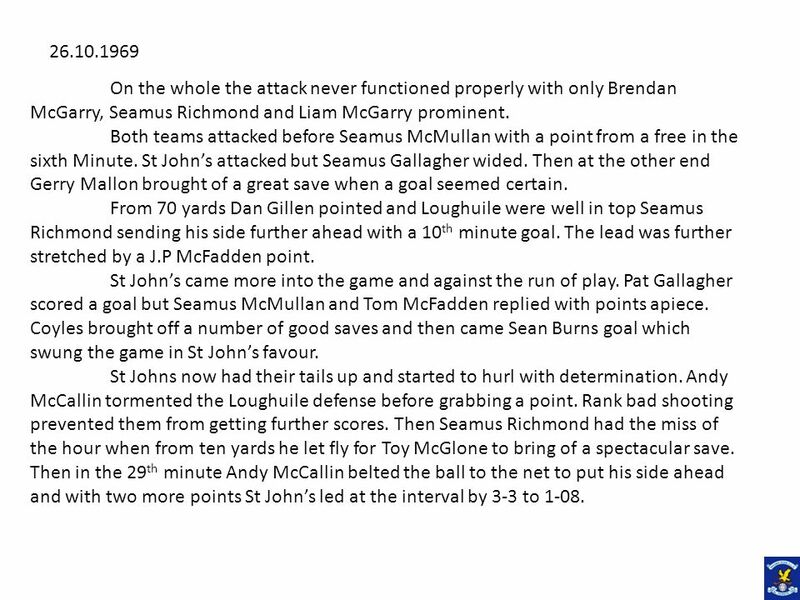 Then in the 29th minute Andy McCallin belted the ball to the net to put his side ahead and with two more points St John’s led at the interval by 3-3 to 1-08. St John’s 3-8 Ballycastle 0-4 Complete superiority in the second half of this Antrim Senior Hurling Championship final at wind-swept Loughuile yesterday brought the title to the Corrigan Park Club for the seventh time. Before describing the play I must pay tribute to players and fans braved the elements. 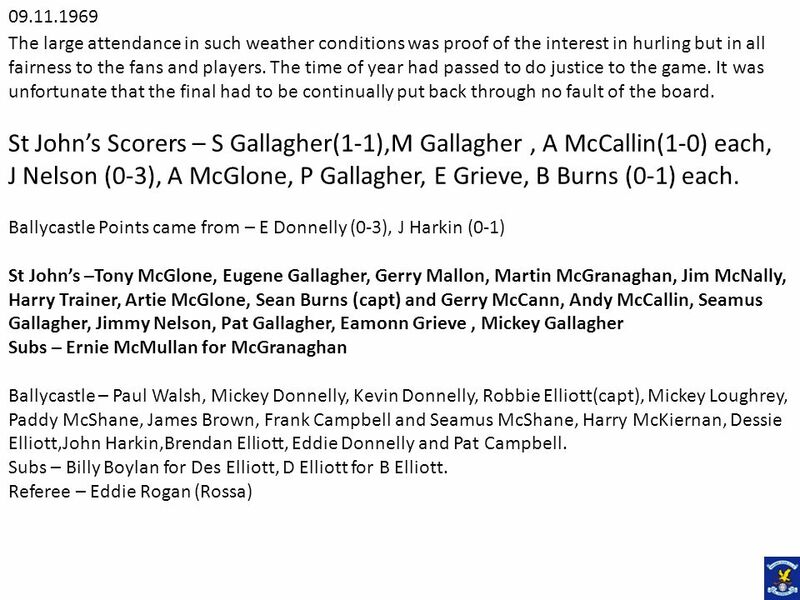 Considering the treacherous conditions the standard of hurling was extremely good. 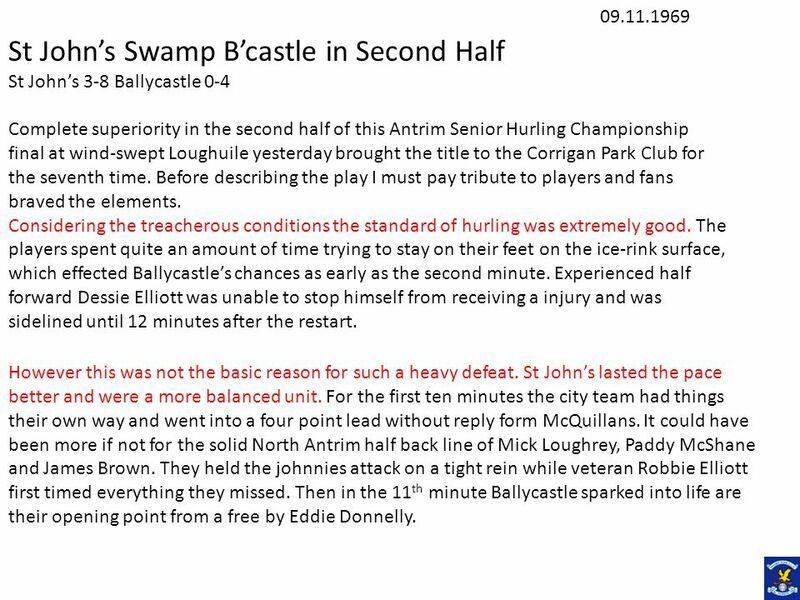 The players spent quite an amount of time trying to stay on their feet on the ice-rink surface, which effected Ballycastle’s chances as early as the second minute. Experienced half forward Dessie Elliott was unable to stop himself from receiving a injury and was sidelined until 12 minutes after the restart. However this was not the basic reason for such a heavy defeat. 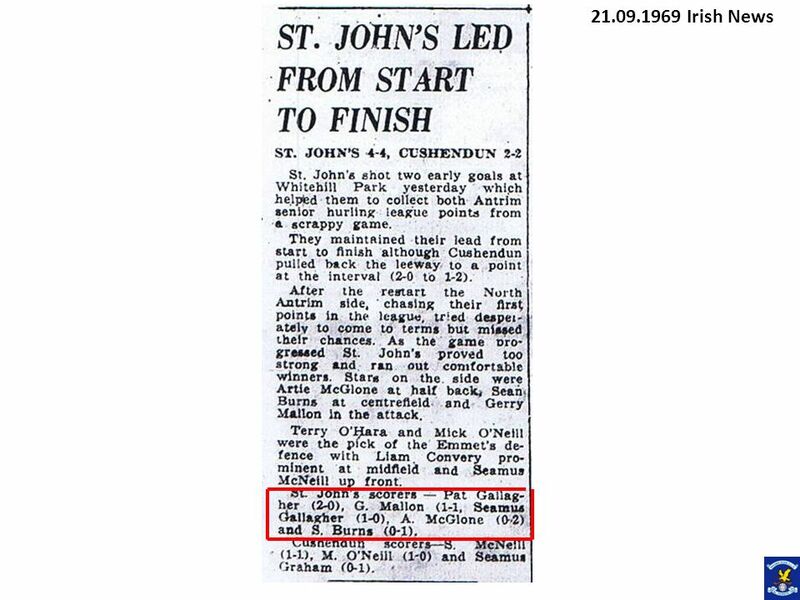 St John’s lasted the pace better and were a more balanced unit. For the first ten minutes the city team had things their own way and went into a four point lead without reply form McQuillans. It could have been more if not for the solid North Antrim half back line of Mick Loughrey, Paddy McShane and James Brown. They held the johnnies attack on a tight rein while veteran Robbie Elliott first timed everything they missed. Then in the 11th minute Ballycastle sparked into life are their opening point from a free by Eddie Donnelly. 15 Superb Hurling They dominated the play until the interval, but had only 3 points to show for their herculean efforts. 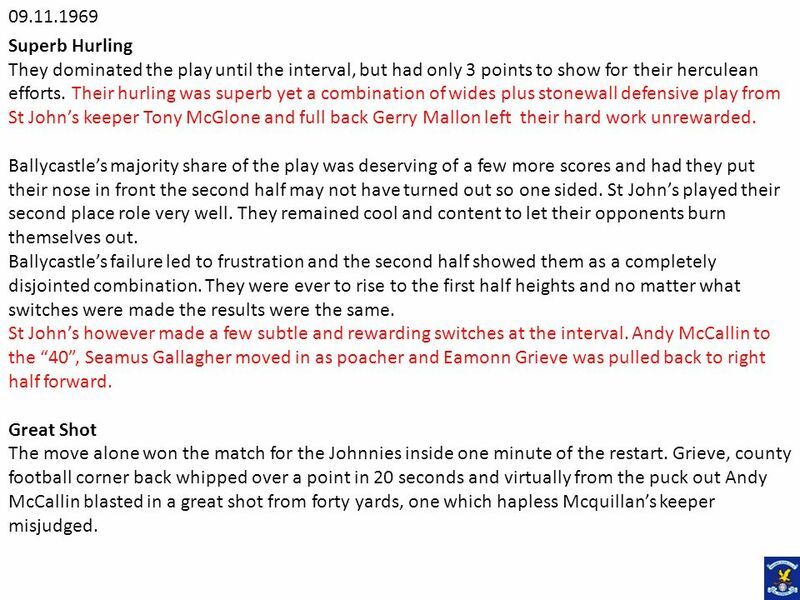 Their hurling was superb yet a combination of wides plus stonewall defensive play from St John’s keeper Tony McGlone and full back Gerry Mallon left their hard work unrewarded. Ballycastle’s majority share of the play was deserving of a few more scores and had they put their nose in front the second half may not have turned out so one sided. St John’s played their second place role very well. They remained cool and content to let their opponents burn themselves out. 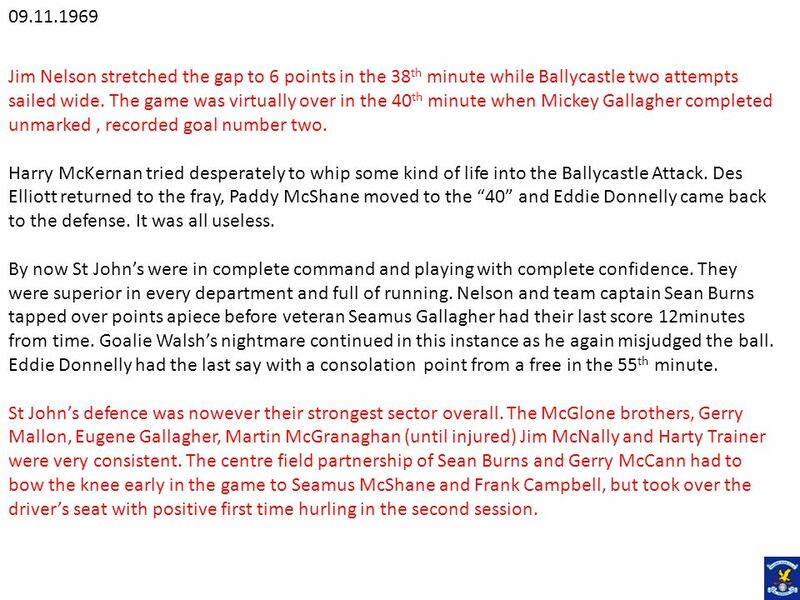 Ballycastle’s failure led to frustration and the second half showed them as a completely disjointed combination. They were ever to rise to the first half heights and no matter what switches were made the results were the same. St John’s however made a few subtle and rewarding switches at the interval. Andy McCallin to the “40”, Seamus Gallagher moved in as poacher and Eamonn Grieve was pulled back to right half forward. Great Shot The move alone won the match for the Johnnies inside one minute of the restart. Grieve, county football corner back whipped over a point in 20 seconds and virtually from the puck out Andy McCallin blasted in a great shot from forty yards, one which hapless Mcquillan’s keeper misjudged. 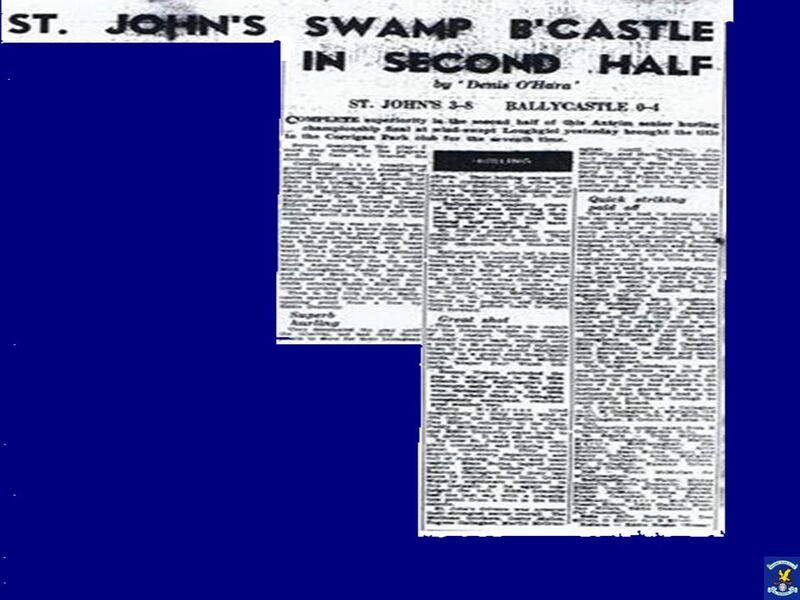 16 Jim Nelson stretched the gap to 6 points in the 38th minute while Ballycastle two attempts sailed wide. The game was virtually over in the 40th minute when Mickey Gallagher completed unmarked , recorded goal number two. Harry McKernan tried desperately to whip some kind of life into the Ballycastle Attack. Des Elliott returned to the fray, Paddy McShane moved to the “40” and Eddie Donnelly came back to the defense. It was all useless. 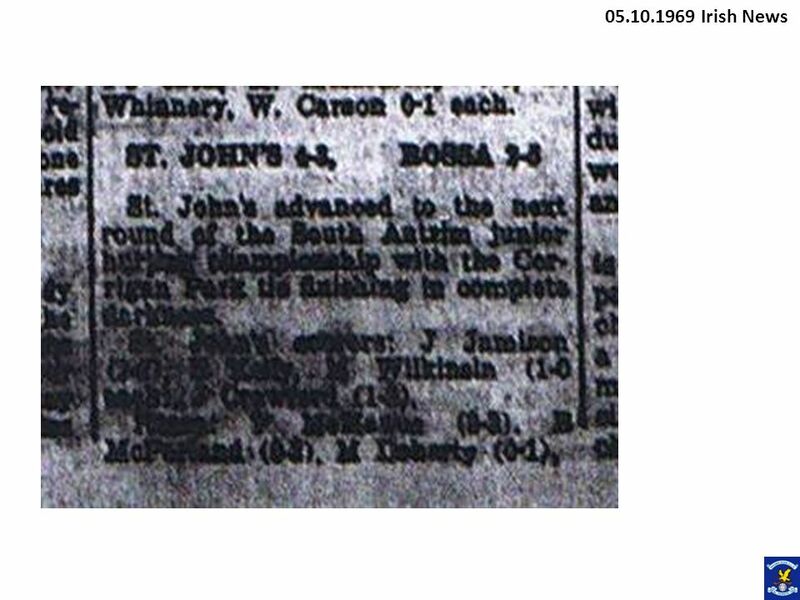 By now St John’s were in complete command and playing with complete confidence. They were superior in every department and full of running. Nelson and team captain Sean Burns tapped over points apiece before veteran Seamus Gallagher had their last score 12minutes from time. Goalie Walsh’s nightmare continued in this instance as he again misjudged the ball. Eddie Donnelly had the last say with a consolation point from a free in the 55th minute. St John’s defence was nowever their strongest sector overall. The McGlone brothers, Gerry Mallon, Eugene Gallagher, Martin McGranaghan (until injured) Jim McNally and Harty Trainer were very consistent. The centre field partnership of Sean Burns and Gerry McCann had to bow the knee early in the game to Seamus McShane and Frank Campbell, but took over the driver’s seat with positive first time hurling in the second session. Quick Striking Paid Off The attack had its moments in the opening seconds, fizzled out for a spell and came roaring back through a new formation. 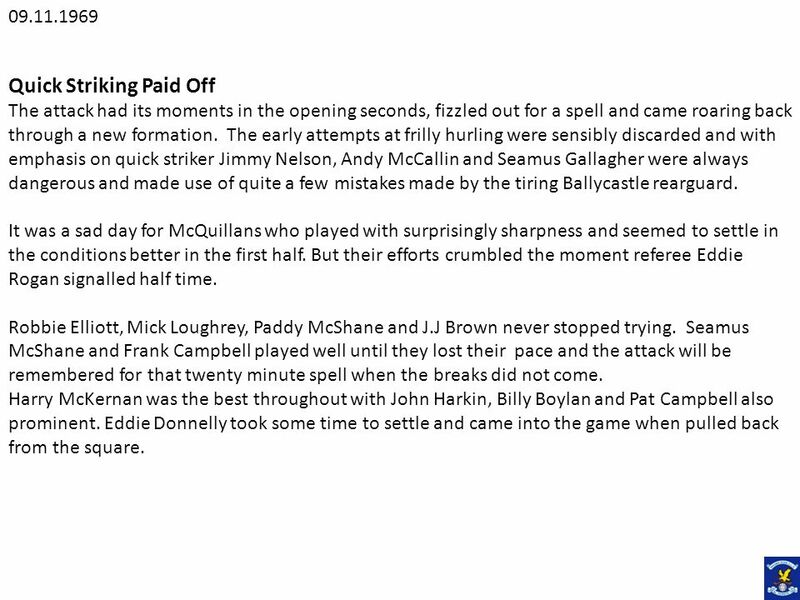 The early attempts at frilly hurling were sensibly discarded and with emphasis on quick striker Jimmy Nelson, Andy McCallin and Seamus Gallagher were always dangerous and made use of quite a few mistakes made by the tiring Ballycastle rearguard. It was a sad day for McQuillans who played with surprisingly sharpness and seemed to settle in the conditions better in the first half. But their efforts crumbled the moment referee Eddie Rogan signalled half time. Robbie Elliott, Mick Loughrey, Paddy McShane and J.J Brown never stopped trying. Seamus McShane and Frank Campbell played well until they lost their pace and the attack will be remembered for that twenty minute spell when the breaks did not come. Harry McKernan was the best throughout with John Harkin, Billy Boylan and Pat Campbell also prominent. Eddie Donnelly took some time to settle and came into the game when pulled back from the square. 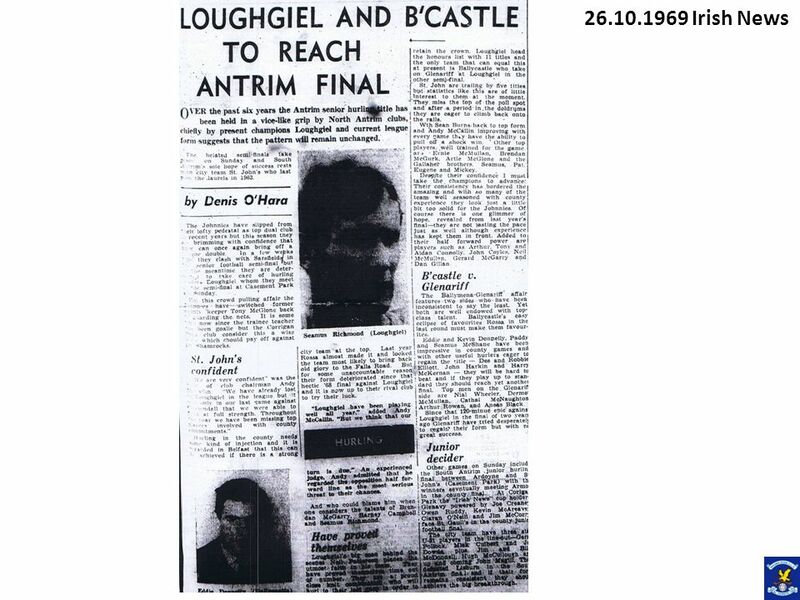 Download ppt "21.09.1969 Irish News." Wide Cones Start in the corner and go wide around each cone. Shoot on goalie between the last two cones. Diagonal Cones Start in the corner and go around. Irish News. Mc GROGANS GOALS WINS St JOHNS ANTRIM SFC CROWN St Johns 2-3 Pearses 0-8 Daniel McGrogan is a habitual goal snatcher. This year. Irish News. McCallin Sparkles as St Johns Easily Master Sarsfields St Johns 1.13 Sarsfields 1.4 In a repeat of last years Antrim Senior football. 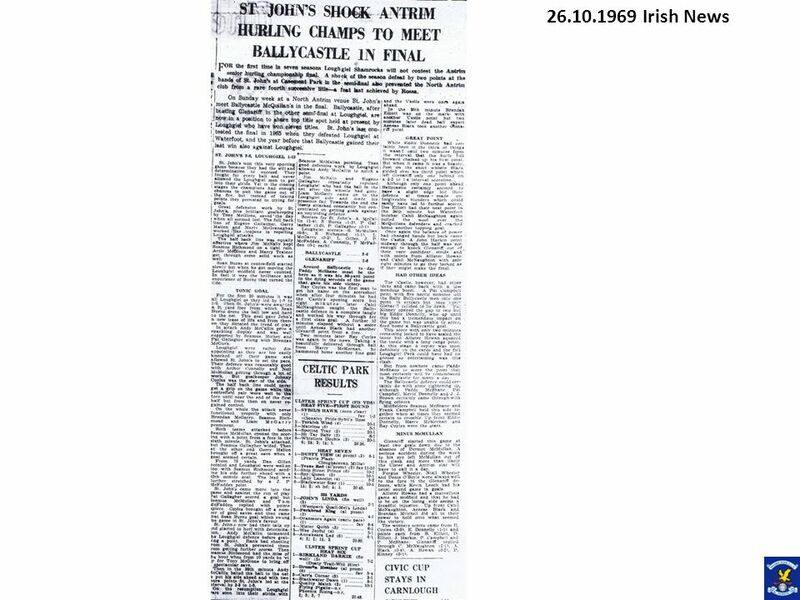 St. Johns 1969 A step back in time By Andy McCallin and Gerry McCann. Developing A Quality Delivery That Provides Power and Control While Reducing The Risk of Arm Injury By Coach Isaac Haynes. Kirkwood Lacrosse Club Statistics and Scoring Based on the 2014 NCAA Statistics Guide. Giving A Foul SITUATIONS WHERE WE WANT TO FOUL 1.At the end of the first half when we have fouls to give before entering putting the opponent in the single. John Paul Academy Teacher v’s Pupil Derby Match 24 th June 2009. Field Hockey History, Field, Players, And Rules. History of Field Hockey Games played with curved sticks and a ball have been found throughout history. Marshall Youth Soccer Coaching Guide U Coaching Support Shannon VanDeVere In-Town Coordinator Coaching Support. Roger Maris: Hall of Famer ? History Through Film Mr. Clark.